When the New Horizons spacecraft finally reaches Pluto in July 2015, researchers will have more objects to study than previously thought. In addition to Pluto's confirmed moon Charon, astronomers have detected two more orbiting celestial bodies, which could help reveal how the planet and moon system formed. 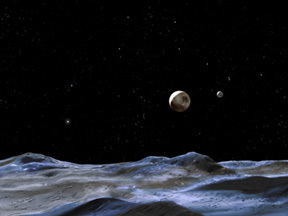 This artist's rendition portrays how the Pluto system might appear from the surface of one of the recently discovered moons: Pluto is the large object near the center with Charon to its right and one of the new discoveries to the left. About 5,000 times fainter than Pluto, the moons remained undetected until May. Image courtesy of NASA, ESA and G. Bacon of the Space Telescope Science Institute. The two faint objects were first noticed in a May 15 Hubble Space Telescope image by team member Max Mutchler of the Space Telescope Science Institute. Three days later, the team looked at more Hubble images to find out if the objects were moons in orbit with Pluto or just objects passing nearby. Hubble revealed that the two objects appeared to be moving counterclockwise in orbit around Pluto, making them satellites of the planet. The team formally communicated their findings in a bulletin released by the International Astronomical Union this week, and it plans to submit three papers to refereed journals. Astronomers previously missed the moons because of their small size and low luminosity, about 5,000 times fainter than Pluto. "The comparatively blinding glare of Pluto really washes them out and makes it difficult to see small, faint satellites that are in relatively close," says Dan Durda, an astronomer at the Southwest Research Institute in Boulder, Colo. "If you're not carefully looking for them, it's very easy to overlook them." Most astronomers consider Pluto to be the ninth planet, but they also consider Pluto to be a member of the icy and rocky disc of debris at the edge of the solar system called the Kuiper Belt. If the bodies discovered in Hubble Space Telescope images last May are indeed orbiting Pluto, then the investigating team of astronomers from the Southwest Research Institute and other institutions say that Pluto is now the first Kuiper Belt object discovered to have more than one moon. Pluto, however, is not the only Kuiper Belt object to have a moon  about a dozen more Kuiper Belt objects have one orbiting companion. Paul Schenk, a planetary geologist at the Lunar and Planetary Institute in Houston, Texas, says that he was not surprised to learn that Pluto had moons, but was more interested in the fact that the moons had maintained a stable orbit. "It's like a juggler managing four objects at once," Schenk says. 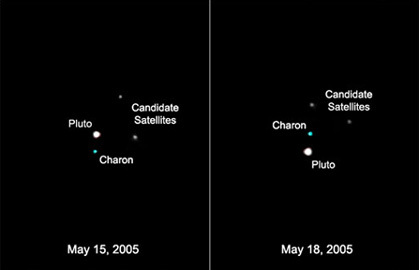 Hubble Space Telescope images show Pluto with its large moon Charon, along with the planet's two new candidate satellites. Between May 15 and May 18, Charon and the two objects appear to rotate counterclockwise around Pluto. Image courtesy of NASA, ESA, H. Weaver (JHU/APL), A. Stern (SwRI), and the Hubble Space Telescope Pluto Companion Search Team. The leading hypothesis for how the system formed, Durda says, is that another Kuiper Belt object collided with Pluto early in its history to create Charon. If an impact were responsible, then astronomers might expect to find leftover debris. "To actually see what could presumably be some of that leftover debris, is supporting evidence for that hypothesis," he says. The other method by which Kuiper Belt objects obtain moons is through gravitational capture of passing objects. Those systems, however, tend to have loosely bound moons that are farther away from the planet; Pluto's moons are relatively close, which, Durda says, lends additional support to the collision hypothesis. More observations and analyses are needed, however, before astronomers can fully support one formation theory over the other. For example, they would like to know whether or not the moons are composed of the same materials as Charon; if the composition were the same, that evidence would further support that a collision was responsible for the moons. The basic physical properties, such as size, exact brightness and orbital characteristics, will also be the subject of future research. "I can guarantee there will be all kinds of follow-up," Durda says. "It's going to swing into high gear now." This discovery comes at a time when Pluto's very definition as a planet has been in debate. Some astronomers argue that Pluto is merely a large Kuiper Belt object  a concept supported by the presence of bodies in the belt that approach and even surpass Pluto in size. Whether or not the discovery of multiple moons will clear the debate over Pluto's status as a planet remains to be seen. According to Schenk, Pluto should be called a planet only because of historical precedence. "If we found it today, we would probably call it a larger member of the outer asteroid belt," Schenk says. But Durda says that the name is not important: "Pluto is an intrinsically interesting planetary object, whether people call it a planet or not," he says. "It's a wonderful representative of many of these objects out there in the Kuiper Belt, and it's a perfect target for the New Horizons mission."